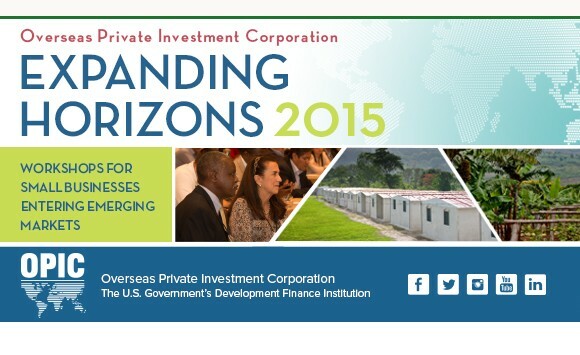 For more than four decades, the Overseas Private Investment Corporation (OPIC) has been the primary U.S. government agency supporting private sector investment in international emerging markets. In an effort to reach out to America’s small businesses, OPIC is organizing Expanding Horizons – a workshop for small businesses entering international markets in Boston on Wednesday, October 14, 2015. This one-day workshop will provide a unique opportunity for participants to learn about U.S. government resources available for small businesses expanding their business internationally and will include presentations by senior government officials from OPIC and other U.S. government trade agencies, as well as insight from U.S. companies currently doing business in foreign markets. It continues the great success of the over 24 similar Expanding Horizons events OPIC has organized around the United States since 2006. WHAT: The Overseas Private Investment Corporation (OPIC), will conduct a workshop for U.S. small to medium size businesses with the latest in the highly-successful Expanding Horizons series that helps businesses learn how they can compete in the global marketplace. A central focus of this event is the opportunity to schedule and meet in “one on one meetings” with OPIC staff and representatives from the participating U.S. government agencies who will answer questions related to YOUR business. It includes workshop materials, a Continental breakfast and a luncheon.